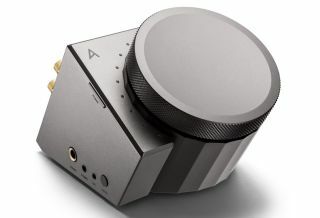 Astell & Kern ACRO L1000 is a hi-res desktop amp and DAC | What Hi-Fi? Astell & Kern is aiming to bring its portable expertise to your desktop with a new range of hi-res audio products. Think of Astell & Kern and you probably think of portable music players. The company has made a habit of turning out Award-winning audio players, capitalising on the growing popularity of high-spec, hi-res machines. But the company has also made occasional forays into other areas - a CD ripper, an all-in-one system and a desktop music player - and now a new desktop audio range is on the way. Astell & Kern ACRO is the name of the range, and the ACRO L1000 is the first product to be revealed. The ACRO L1000 is a desktop amplifier, headphone amp and DAC, complete with an eye-catching aluminium design. It will arrive in the UK later this month and cost £799. Tucked behind the large angled volume wheel you'll find 2.5mm, 3.5mm, 6.5mm and XLR audio outputs, plus speaker terminals for connecting to desktop speakers. A USB input allows you to connect your PC or Mac. As you'd expect, the ACRO L1000 can play hi-res audio files up to 32bit/384kHz without downsampling, thanks to two AK4490 DACs (as found in the AK380) and a 32-but CPU. The L1000 also supports native DSD playback up to 11.2MHz. The volume wheel not only looks rather smart but also features LED lights that indicate the volume and which sound setting you’re using: blue for the default setting, green for the bass-boost and red for the high-gain mode. We're certainly eager to get our hands on it, and thankfully we won't have long to wait - the Astell & Kern ACRO L1000 will get its full launch at CES in Las Vegas next week.